It really doesn't seem possible, but today is our silver wedding anniversary! We celebrated with a lovely dinner at one of our favorite restaurants. Of course, our "big" celebration was last month's trip to London and Disneyland Paris. I am very grateful for the many blessings we have enjoyed together over the past quarter century, especially four beautiful children. 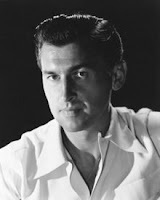 Turner Classic Movies pays tribute to Star of the Month Stewart Granger with 22 films airing Tuesdays in July. As I've mentioned here previously, Granger is one of my favorite actors; my favorite Granger film, KING SOLOMON'S MINES (1950), airs on July 7th. This is the film that made Granger a big star outside England. He is absolutely marvelous in a charismatic performance as safari guide Allan Quartermain. If you're unfamiliar with Granger's work, this movie is a great introduction. One of his very best swashbucklers, the colorful, action-packed SCARAMOUCHE (1952), also airs on the 7th. July 14th is devoted to Granger's Westerns. One might not expect a British actor to star in many Westerns, but Granger was very much at home in the genre. He plays a Canadian trapper in THE WILD NORTH (1952); it's not a great movie, but worth seeing for fans of Granger and Cyd Charisse. Cyd plays Granger's love interest, an Indian maiden. GUN GLORY (1957) is a Western I enjoyed very much. The evening also includes THE LAST HUNT (1956) costarring Robert Taylor. July 21st is a series of Granger crime films, including the very entertaining mystery THE WHOLE TRUTH (1958), costarring Donna Reed and George Sanders, with a score by John Dankworth. FOOTSTEPS IN THE FOG (1955), costarring Granger's wife, Jean Simmons, is a film I've not yet seen. The final evening, July 28th, is devoted to "Romance and Adventure." One of Granger's best films, THE PRISONER OF ZENDA (1952), airs this evening. ZENDA reunited Granger with his KING SOLOMON'S MINES costar, Deborah Kerr. I also liked ALL THE BROTHERS WERE VALIANT (1953), a sailing story with Robert Taylor and Ann Blyth, and GREEN FIRE (1954), a jungle adventure with Grace Kelly. YOUNG BESS (1953) stars Granger with two of his favorite leading ladies -- his wife, Jean Simmons, and Deborah Kerr. Two of Granger's films with Ava Gardner, BHOWANI JUNCTION (1956) and THE LITTLE HUT (1957), also air on the 28th. There are a couple of Granger's films I wish they had included, such as ADAM AND EVELYNE (1949), which I just saw last weekend, or the comedic Western NORTH TO ALASKA (1960) with John Wayne, but all in all it's an excellent group of some of Granger's very best work which is a wonderful opportunity for film fans to become more acquainted with a terrific actor. Update: Don't miss this great post on Granger coauthored by Moira Finnie and Peter Bosch at TCM's Movie Morlocks blog. Having spent the last couple days working nonstop on proofreading a trial transcript, it was wonderful to take a few hours off and spend them at Disney's California Adventure. Sunshine Plaza will eventually be completely redesigned as part of the ongoing renovations at California Adventure. It was a glorious afternoon on Paradise Pier -- hot but not too hot, with a nice breeze every now and then. The kids got me to go on the Sun Wheel -- oops, forgot its new name, the Fun Wheel! Of course, once I was on the swinging car I remembered why I hadn't been on it in roughly five years! It's scarier than it looks (grin). Towards the back of the photo -- click to enlarge -- you can make out the work area for the Little Mermaid ride. The Golden Dreams movie is disappearing -- wonderful news for those of us who didn't care for its politically correct, negative rendition of history. Mr. Potato Head pulls off his ear for us as we wait in line for Toy Story Mania! It's the little touches that add fun to the day (grin). They even got me to go on California Screamin'...it was only my second time on it and I liked it better this time. The park was nice and uncrowded today, which added to the fun. We ate for the first time at Cocina Cucamonga. The food was pretty good. The grand finale to our day was the newly refurbished Electrical Parade, which I hadn't seen in a couple of years. The music always gives me goosebumps...it takes me back to summer evenings during the years I worked at Disneyland. Alice (above) and Cinderella (below). A happy day was enjoyed by all! ADAM AND EVELYNE is a very entertaining British romance which is something of a forerunner to later American films such as SABRINA (1954) and DADDY LONG LEGS (1955). Wealthy Adam Black (Stewart Granger) makes his living running exclusive gambling evenings in homes around London. When Adam fulfills a pledge to a dying friend and moves orphaned teenager Evelyne (Jean Simmons) into his home, life turns upside down for Adam and his loyal major domo, Bill (Edwin Styles). Evelyne -- who believes her adored benefactor earns a living working on the stock market -- is sent by Adam to an exclusive Swiss finishing school, which is a far cry from Evelyne's stark upbringing in a British orphanage. Two years later a glamorous, more mature Evelyne returns to London, where she attracts the attention of Adam's rascally younger brother Roddy (Raymond Black). And Adam finds himself very confused indeed, as his own feelings for Evelyne change from paternal to romantic. Granger was 36 and Simmons 20 when they made ADAM AND EVELYNE. Their relationship is charming and believable -- Granger and Simmons married the year after this film was released. Simmons seamlessly portrays the transition of Evelyne from a chatterbox teenage Cinderella to a beautiful young woman in love, and determined to see her man reform. Stewart Granger is one of my very favorite actors, and he's wonderful in this as usual as the suave, elegant Adam. The supporting cast includes Helen Cherry, Joan Swinstead, Fred Johnson, Geoffrey Denton, and Wilfrid Hyde-White. Hyde-White has a key scene late in the film in which he shares with Evelyne some of his thoughts on life and heroes with feet of clay. The U.S. title of the film is ADAM AND EVALYN. I can only surmise there was concern U.S. audiences wouldn't be able to properly pronounce Evelyne and so the name was spelled phonetically here! ADAM AND EVELYNE was directed by Harold French. It was filmed in black and white and runs 92 minutes. ADAM AND EVELYNE is not available on VHS or DVD in the United States, although it has had a Region 2 release in Europe. The film has been shown on Turner Classic Movies; the print I recorded a few months ago wasn't one of the best the station has shown and was quite dark in a couple stretches, but otherwise it was watchable. Unfortunately this title is not on the schedule as part of TCM's tribute to its July Star of the Month, Stewart Granger. Click here for a page where you can request that TCM add the movie to its schedule. ADAM AND EVELYNE is one of so many relatively unknown movies awaiting discovery by new audiences. It provides a wonderful evening's entertainment. Here's a fun Saturday read about a unique profession -- working as a chef on a constantly swaying private railroad car. Lt. Commander Ken White (William Holden) spends the post-WWII years toiling in a dull desk job, increasingly haunted by an incident that happened on the Tiger Shark, a submarine under his command, on the last day of the war. As the Korean War begins to heat up, Ken finds himself once again commanding the Tiger Shark. Can Ken finally put his bad memories to rest? Nancy Olson plays Holden's beautiful wife, Carol; she and Holden teamed in four films in 1950-51, including SUNSET BOULEVARD, FORCE OF ARMS, and UNION STATION. Don Taylor plays Pete, a flyer rescued by the Tiger Shark during WWII who becomes a good friend of both Ken and Carol, despite his penchant for trying to forget a back injury with booze and partying. William Bendix plays a submarine crew member who resents Ken's WWII decisions and is not happy to be reunited with Ken years later. Holden, Olson, and Taylor are all appealing performers who are most enjoyable in the film. Bendix has never been my particular cup of tea, but he is right for an unpleasant role as an unforgiving man who refuses to see more than one side to a story. This is a solid, well-crafted film, the kind of good "run-of-the-mill" entertainment which Hollywood turned out routinely decades ago and which perhaps is best appreciated now, from the vantage point of over half a century later. The movie has a feeling of "by the book" Navy authenticity which adds to the viewer's enjoyment. The opening credits note that the film was shot on Navy ships and installations. IMDb credits the U.S. Naval Base in San Diego. The supporting cast includes Jack Kelly (TV's Bart MAVERICK) as a crew member; he is frequently seen at the edge of the frame in group shots, with a more significant role near the end of the film. Arthur Franz, Darryl Hickman, Moroni Olsen, Jerry Paris, Jack Gregson, and Peggy Webber are also in the cast. Robert Mitchum's brother, John, has a bit part. SUBMARINE COMMAND was directed by John Farrow. It was shot in black and white and runs 87 minutes. SUBMARINE COMMAND is not available on DVD or VHS. It's a Paramount movie which has been shown on Turner Classic Movies. Click here for a page to request that TCM schedule the movie or to vote your interest in a DVD release. TCM doesn't have a trailer, but has a clip of a key moment of crisis early in the film here. 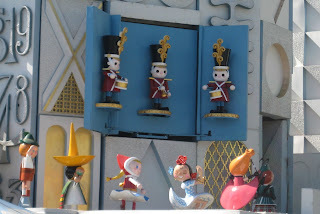 Here's another peek at Disneyland Paris for Disney theme park fans, focusing today on Disneyland Park's Fantasyland. First, a couple of general comments about Disneyland Paris: We expected to enjoy Disneyland Park, but we weren't prepared to be completely, totally impressed...and we were. Disneyland Park is simultaneously huge and richly detailed, with attention to the smallest details and fascinating "nooks and crannies" to explore around every corner. La Galerie de la Belle au Bois Dormant is but one example, as described in my post Disneyland Paris: The. Best. Castle. Ever. 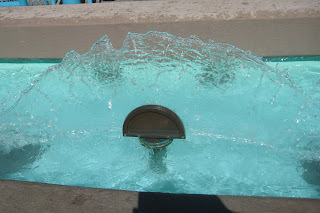 The entire park was filled with sights which provided "wow" moments. 1) As I have alluded to in other posts, the food was uninspired, repetitive (cold cuts and salads, anyone? ), and overpriced. Given France's reputation for fine cuisine, we were expecting to find wonderful Disney World style restaurants, but the food was mostly blah. And when did Ben and Jerry's Ice Cream take over Western Europe, anyway? 2) Bathrooms were often poorly maintained and not what guests of the Anaheim and Florida parks have come to expect. 3) Attraction maintenance was not always at Disney standards. The close-up photo of the Teacups below, for example, shows that both the saucers and the ride floor itself need cleaning and painting. Trash on rooftops was visible from lines for the Main Street train station and Big Thunder Mountain. 4) Some rides are down in the off season, such as the Casey Jr. and Storybook Land Canal boats. I don't know if the park has more than one train, but there was only one running and we didn't have time for an hour-long wait for a ride around the park -- and we tried two different stations. 5) The park is working to reduce smoking, but Europeans still like their cigarettes and they were frequently in evidence outside the designated "smoking" areas. Despite these flaws, I think overall we found Disneyland Park of Paris more impressive than Florida's Magic Kingdom, which we also love. We expected our visit to Disneyland Paris to be a one-time-only shot, but we left hoping that we'll have the opportunity to return one day, as it was too special to visit only once. And now, on to Fantasyland! And here's Les Voyages de Pinocchio. 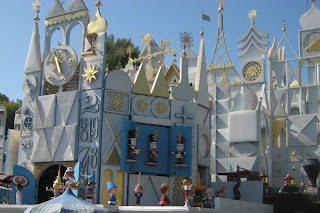 The original Pinocchio ride is in Anaheim; this is a ride which wasn't duplicated in Florida. Paris has Mad Hatter's Teacups -- note that, like Florida, the ride has a cover protecting it from the elements. The Anaheim version doesn't have a "roof," as seen here. Those who have been to Orlando may remember that the ride's facade and boat line are both completely indoors at the Magic Kingdom, as can be seen in a photo here. These rides, which are Disneyland originals not duplicated in Florida, were sadly closed during our visit. We must have spent half an hour wandering through the labyrinth, exploring the paths and the castle found along one of the many pathways. 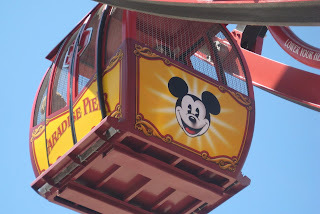 Other Fantasyland attractions in Paris include Peter Pan's Flight, Dumbo the Flying Elephant, and Blanche-Neige et les Sept Nains (Snow White). Previously: Eurostar to Disneyland Paris: The Only Way to Travel! ; Disneyland Paris: Walt Disney Studios Park; Disneyland Paris Resort: Sequoia Lodge; Disneyland Paris: The. Best. Castle. Ever; Disneyland Paris: The Resorts; Disneyland Paris: The Molly Brown. 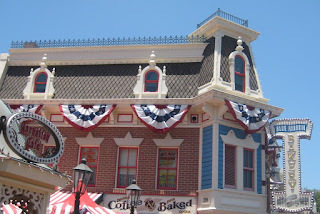 Coming soon: More on Disneyland Paris; books on Disneyland Paris. "One of the Worst Mistakes in the History of the Republic"
Today President Obama, stumping on national television for his socialized health care plan, suggested "...one way to shave medical costs is to stop expensive and ultimately futile procedures performed on people who are about to die and don't stand to gain from the extra care." Mr. Obama said, "Maybe you're better off not having the surgery, but taking the painkiller." What's unspoken in his statement, of course, is that if his health care plan passes, it won't be patients, families, and doctors making that decision, but the government, which would approve care based on age, likelihood of recovery, and other factors, just as is already happening in the UK, Canada, and other countries with socialized medicine. It's not a big leap to imagine that many of those in a society who are unwilling to protect the unborn won't have much respect for the elderly or the ill, either. (It's worth remembering that the President himself, by his own words and actions, clearly supports infanticide and denial of care to babies who survived abortions.) Are we willing to become a society which focuses on handing out painkillers to the elderly or ill and denying other options, so that money can be saved to treat those who are younger, healthier, or more privileged? If socialized medicine passes, that's coming. When a doctor challenged Mr. Obama that "elites often propose health care solutions that limit options for the general public, secure in the knowledge that if they or their loved ones get sick they will be able to afford the best care available, even if it's not provided by insurance," Mr. Obama would not commit for his own family to be treated strictly under the plan he is proposing. John Hinderaker at Power Line: "But the worst thing about socialized medicine isn't its ruinous cost, or the rationing of medicine, or the inevitable decline in quality. It's the change it implies in the relationship between the individual and the state. As Mark Steyn has written, once a country adopts socialized medicine, there is no such thing as a freeborn citizen. Every child is born a ward of the state. "Congress is on the brink of making one of the worst mistakes in the history of the Republic. It remains to be seen whether the disaster that is socialized medicine can be averted." Thursday Update: Ed Morrissey on "Obama's Michael Dukakis Moment": "If ObamaCare isn’t good enough for Sasha, Malia, or Michelle, then it’s not good enough for America." And we haven't even addressed that Congress specifically exempts itself from receiving health care under the plan being created, or that union employees would be exempted from paying tax on their health care plans. To paraphrase Orwell, apparently some animals are "more equal than others." Update: Obama's "take the painkiller" line is even more chilling when you hear it in complete context: it was part of an answer to a woman whose 105-year-old mother received a pacemaker at age 100 and was concerned about arbitrary age cutoffs for treatment. Obama's answer was that doctors cannot consider subjective factors like "spirit" and that in many cases the elderly are "better off not having the surgery, but taking the painkiller." Nowhere in his answer did he affirmatively agree that there needs to be room in a government-run plan for someone like this century-old woman to receive a pacemaker or other procedure...he immediately jumped to "take the painkiller." Here's some analysis from Karl at Hot Air, including Obama's "Hurry up and die already" moment. And Ed Morrissey writes about the $4 trillion price tag -- just for starters -- which would be for a plan which still doesn't cover everyone, provides care at sub-optimum levels, and throws a third of Americans off their current private plans and into the government system. Those who want to massively overhaul our healthcare system seem to want to use a bazooka to kill a fly. Why not focus first on making the current government-run plans solvent? Update: Welcome to readers of Yahoo News! 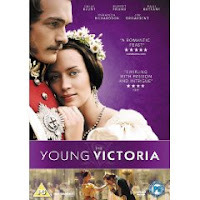 ...because THE YOUNG VICTORIA comes out on DVD in the UK on July 13th! There's still no U.S. theatrical release date in sight. Perhaps it's being held for fall Oscar season? Last month I was fortunate to see this movie -- twice! -- on British Airways; you can read my rave review here. THE YOUNG VICTORIA is one of my favorite movies of the last few years...and I would really like to watch it on a larger screen without airplane engine background noise. 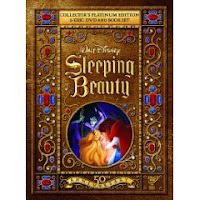 I became particularly interested in an all-region player after reading a post by Leonard Maltin about a Special Edition of SLEEPING BEAUTY, my favorite Disney film, which comes with a beautiful 120-page book about the making of the movie. For unknown reasons this edition has never been released in the United States. I've also been waiting forever for POLDARK to hit Region 1, although I have some concerns about editing mentioned in an Amazon review of POLDARK 2. My birthday is next month so...I think it's time to take the all-region plunge! The Academy of Motion Picture Arts & Sciences has announced it's going to expand the Best Picture category from five nominees to ten. Decades ago the Academy had ten Best Picture nominees, ending the practice after 1943. Having ten nominees made sense in a year like 1939, when Best Picture GONE WITH THE WIND was joined on the list by MR. SMITH GOES TO WASHINGTON, THE WIZARD OF OZ, STAGECOACH, WUTHERING HEIGHTS, LOVE AFFAIR, NINOTCHKA, DARK VICTORY, GOODBYE MR. CHIPS, and OF MICE AND MEN. Or take a look at the following year's list of 10: REBECCA (the winner) and THE PHILADELPHIA STORY, FOREIGN CORRESPONDENT, THE LETTER, THE GRAPES OF WRATH, THE LONG VOYAGE HOME, THE GREAT DICTATOR, OUR TOWN, KITTY FOYLE, and ALL THIS AND HEAVEN TOO. Or the year after that: HOW GREEN WAS MY VALLEY (the winner), CITIZEN KANE, THE MALTESE FALCON, SERGEANT YORK, THE LITTLE FOXES, SUSPICION, HERE COMES MR. JORDAN, HOLD BACK THE DAWN, ONE FOOT IN HEAVEN, and BLOSSOMS IN THE DUST. Even the weakest of those titles has stood the test of time as a solid, well-crafted movie remembered decades later. And most of the films are four-star classics. The Academy really thinks there are currently ten releases a year which will stand the test of time as these movies have from the '30s and '40s?! Update: Thoughts from Kenneth Turan. Dr. Jerri Nielsen, whose struggle with breast cancer while stranded at the South Pole a decade ago was the subject of a book and TV-movie, has passed away at the age of 57. Members of the U.S. Air Force risked their lives to air drop drugs and equipment to Nielsen after she performed a biopsy on herself and received a cancer diagnosis. Months later she was able to be airlifted from the South Pole. As an "armchair adventurer" who enjoys reading about remote locations such as Mount Everest and the South Pole, I found Nielsen's book a very interesting read. I was fascinated by her descriptions of the unique lifestyles of South Pole scientists and support personnel, who are separated from the rest of the world by weather conditions for months at a time. Susan Sarandon played Nielsen in a 2003 TV-movie. Sarandon was excellent, although -- as is so often the case -- I felt that the book was better than the movie. I was sorry to learn that Nielsen's fight with cancer resumed in 2005. Update: A good story on Nielsen is here. 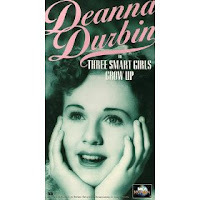 THREE SMART GIRLS GROW UP finds charming Deanna Durbin reprising her role as Penny from THREE SMART GIRLS (1936). Penny, ever the "Little Miss Fix-It" -- as Durbin herself once referred to her typical role -- works her magic to ensure that her sisters' romances turn out happily. Nan Gray returns as Penny's sister Joan, while the other "smart girl," Kay, is played by Helen Parrish this time around. Parrish, a frequent Durbin costar, replaces Barbara Read, who played the role in the first picture. Ray Milland, who was also in the first film, is sadly missing this time around, but the girls' boyfriends are satisfactorily played by a young-looking Robert Cummings and William Lundigan. Parrish sighs longingly over Lundigan, who's engaged to Gray, who's secretly yearning for Cummings...obviously Deanna needs to step in and set things right! The plot, which finds Penny continually ignored or misunderstood by her parents (Nella Walker and Charles Winninger) and sisters, is not quite as much fun as some of Deanna's other films, but it moves along at a good pace and has many enjoyable moments...and when Deanna sings, it's simply magical. Many wonderful sopranos have starred in movie musicals, yet no one was ever quite like Deanna, one of the most unique stars in movie history. Ernest Cossart is particularly good reprising his role as Binns, the butler who is also Penny's confidant. Classic film fans will enjoy the many familiar character faces in bit parts, including Charles Coleman, Mary Treen, Milton Kibbee, Grady Sutton, Thurston Hall, Mary Forbes, Doris Lloyd, Bess Flowers, and everyone's favorite movie minister, the Rev. Neal Dodd. 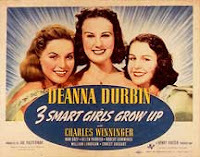 THREE SMART GIRLS GROW UP was directed by Henry Koster, who made half a dozen Durbin films. The movie was shot in black and white and runs 89 minutes. THREE SMART GIRLS GROW UP is available on VHS in a very nice print. Previous reviews of other Deanna Durbin movies: FIRST LOVE (1939), HIS BUTLER'S SISTER (1943), NICE GIRL? (1941), FOR THE LOVE OF MARY (1948), BECAUSE OF HIM (1946), MAD ABOUT MUSIC (1938), and THE AMAZING MRS. HOLLIDAY (1943). Update: Here is a review of the final film in the SMART GIRLS series, HERS TO HOLD (1943). Update: THREE SMART GIRLS GROW UP is now available on DVD. Here is a much-better-than-average trailer for a movie that was completely off my radar screen until I saw the trailers today: FAME, a remake of the 1980 movie about the New York City Academy of Performing Arts. I've always been partial to the theme from FAME and got a real charge out of seeing favorites like Bebe Neuwirth and Kelsey Grammer -- Lilith and Frasier! -- pop up as teachers while the song is playing in this trailer. I love Neuwirth's casting as a dance teacher. Here is a different "teaser" trailer. The original movie was rated R -- although by today's diminished standards I wonder if it would be PG-13. I hope this new version is family friendly enough to appeal to the HIGH SCHOOL MUSICAL crowd. It looks like the film has real possibilities. The original film spawned a TV version which ran for several years. With Neuwirth and Grammer in the cast of the remake, I couldn't help wondering if a second TV series could be in the future as well. Today at Disneyland: It's Summer! Another week, another beautiful day at Disneyland USA, as we celebrated the start of summer vacation with friends. And what a gorgeous blue sky! It was a real treat to finally meet longtime commenter Irene at the Golden Horseshoe! She was every bit as nice and friendly as I expected from her notes, and we certainly do have a lot in common. We even figured out a while back that we have mutual friends. Hopefully we'll have the opportunity in the future to enjoy Billy Hill and the Hillbillies together! Click to enlarge any of the photos for a better view. The elephants on the Jungle Cruise know how to stay cool too! We hope to return soon to see the new -- or newly refurbished -- Nightastic! entertainment, including the Electrical Parade, the Magical fireworks, the Pixie Hollow lights, and Fantasmic! 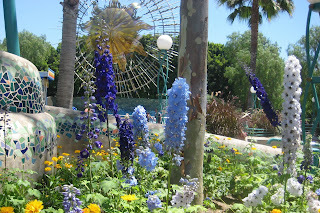 Recent related posts: Today at Disneyland: Almost Summer; Disneyland: Almost Summer, Part 2.